What do you get for the designer who has it all this holiday season? The options are almost limitless with so many cool items out there for work and play. 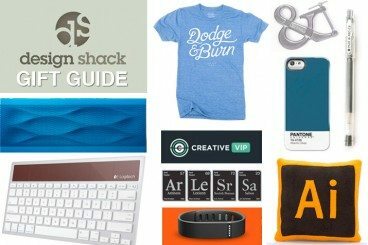 From items under $10 to some rather pricey toys, Design Shack has the perfect gift ideas for every creative on your list this year. There are also plenty of digital options that are great if you have waited until the last minute to start shopping. (The hardest part will be not buying everything for yourself.) Happy holidays… and happy shopping! Great design tools, goodie bags and resources are an essential part of every creative professional’s workflow. Creative VIP bundles all of these items into a single package. Benefits include great discounts for items such as grid and DV hosting from Media Temple, discounts at Fontdeck and discounts on design kits from Designmodo. Elite plans also come with a goodie bag that is mailed out every 12 months and includes cool tools including pens, notebooks and more. Creative VIP plans are $5.99 (standard) and $9.99 (elite) per month. The A Book Apart library contains 10 awesome books for web professionals and the complete set is available in paper and digital formats. The collection written by some of the best in the business includes: HTML5 for Web Designers, CSS3 for Web Designers, The Elements of Content Strategy, Responsive Web Design, Designing for Emotion, Mobile First, Design is a Job, Content Strategy for Mobile, Just Enough Research and Sass for Web Designers. The A Book Apart Library is $125 for hard copy and $62.50 for ebooks. It’s easy to learn something new with all the resources available from Tuts+. From online course to guides to ebooks to fresh content every week, A Tuts+ Premium Membership is on every designer’s wish list. Tuts+ Premium Memberships are $19 per month or $180 annually. Adobe products are likely the tool behind the workflows of most creatives, and with a digital cloud membership you can access the full line of products from your desktop. Or for photography pros, you can buy a simple plan that includes Photoshop CC and Lightroom 5 at a discounted rate. Adobe Creative Cloud Memberships start at $49.99 per month, but there are a variety of discounts available. Photoshop/Lightroom plans are $9.99 per month. My iPhone is never far from my side, and a case from Pantone would make it stand out from the crowd even more. Cases are made with a hard-shell construction and have a high gloss finish, plus the Pantone color name and code, of course. With options for both iPhone 5 and 4 models, there is a color for everyone. Pantone iPhone Cases are $34.95. Add a little typography style to almost any room with the adjustable “Clampersand,” a heavy-duty clamp with an ampersand shape. It makes a perfect stopper for bookshelves, in the garden or toolshed. The Ampersand Clamp is $40. How well do you know your lettering? This memory card game tests those skills. The kit also includes a nice typography glossary and a lesson in the history of typography. The Quick Brown Fox Jumps Over the Lazy Dog Card Game sells for $25. Sticky notes with personality can make any office space a little more fun. Recycle old sticky notes and turn them in to 3D models. Each pad has instructions for 10 different shapes, including pig; penguin; boat; crane; butterfly; squirrel; lily and water bomb. The Origami Sticky Note Pad is $4. Moleskine Evernote Notebook Bundle retails for $94.75. The recently-released Smashing Book #4 provides practical, actionable takeaways by respected web design experts. The book is packed with smart techniques, ideas and approaches for front-end development, performance, psychology and web typography. The Smashing Book #4: New Perspectives on Web Design is available in hardcover for $49 and ebook versions are included. Adobe fans will love the stuffed icon pillows from mysuitestuff. Each fluffy fleece pillow comes in the fashion of the creative suite. App Pillows are $19 or $95 for the full set. It’s the business magazine for creatives. With a new magazine every other month, this subscription is packed with ideas for creative and suggestions for running and functioning in the creative business market. How Magazine print subscriptions are $29.96 (U.S.), $44.96 (Canada) and $51.96 (International). Digital subscriptions are $19.96. Did you know you should walk at least 10,000 steps per day? Track your movement and get away from the desk with the Fitbit Flex fitness tracker. The cool little armband tracks physical activity and sleep and syncs easily to your mobile device or computer. Track your results, earn badges and share with friends. The Fitbit Flex is $99.95. Go green with a solar-powered keyboard that is bluetooth-enabled. It will even work for three months in the dark from a full charge. What’s even cooler about this keyboard is that it will connect seamlessly to all your Apple devices – desktop, iPad and iPhone. The Logitech Wireless Solar Keyboard retails for $79.99. Every creative needs something funky for their office. Consider the Periodic Table of Typefaces, a wall decal that can add a little flair to any workspace. It comes in four colors and is 45 by 27 inches in size. The Periodic Table of Typefaces is $49. As the authority on digital learning, Lynda.com has thousands of great tutorials on every topic from design basics to lessons on how to use software. For creatives looking to learn a new skill, this is one of the easiest places to start. Lynda.com Subscriptions start at $25. Get a few giggles with the Oh, Crop magnet. Designers will love the sentiment of this sturdy magnet, available in several shapes. The Oh, Crop Magnet is $5 from Cafe Press. The Drogo is made from genuine black leather and has an embossed dragon decorating the outside of the case. The smart magnets will send your iPad quickly in and out of sleep mode. Drogo Leather iPad Case is $99.95. Inspired by the good old-fashioned process of film photography, the Dodge & Burn shirt features beautiful typography with philosophy creatives will appreciate. Dodge & Burn T-Shirts are $29 and come in several colors. Play a game of Scrabble with letters showcasing various typefaces. This super nice set is made of solid wood on a lazy susan and comes with a fabric pouch, timer, scorecard and score book. The game is designed by Andrew Clifford Capener, a designer and entrepreneur. The Scrabble Typography Limited Edition is $199.99 and a limited number are available. For the color lover in your life is the color wheel pendant. This simple necklace features the standard wheel on a gold-dipped chain. The Color Wheel Pendant is $44. Help your creative keep up with his or her business with a gift card that will help create new business cards, stickers, notecards and more from Moo. Moo Gift Cards come in a variety of design and you can choose the amount from $10 to $100. Sometimes designers just need a little inspiration to get through a tough project. That’s where the Ultimate Creative Workshop Collection comes in. This set of two books – Creative Workshop, Graphic Design Exercise Book – and video – 7 Killer Steps to Generating Big, Fat, Hairy Design Ideas – will help designers jumpstart their creativity. The Ultimate Creative Workshop Collection is $62.99. This little bluetooth enabled speaker packs a big punch and syncs with all of your wireless devices for hours of music anywhere. The portable box, which can stream and share music, movies, games and more, has a great sound. The Jambox Jawbone comes in seven colors and is $149.99. You never know when you will need to scan something in a flash and this mobile scanner works without a computer. It scans and creates searchable PDFs and will sync with apps. Comes with a 2GB SD memory card and will work with your iPad. The Doxie One Paper and Photo Scanner is $149. Tie up all those pesky cables with reusable Velcro ties. The strong strips are durable, self-gripping and work on practically any surface. Velcro Reusable Straps are $6.39. There’s nothing like the perfect pen for everyday writing or sketching. This pen from Pilot has a clean, precise line that is perfect for fine writing or sketching. Plus it has a textured grip and is smear proof. Pilot G-Tec-C Gels Pens are $8.50. Coffee drinking is almost synonymous with design and the AeroPress Coffee and Espresso Maker makes a great cup. It uses ideal water temperatures and gentle air pressure brewing to produce coffee and espresso that has rich flavor with lower acidity and without bitterness. It makes 1 to 4 cups of coffee or espresso, features a micro filter and takes just 1 minute to make coffee. The AeroPess Coffee and Espresso Maker is $29.99.